ePublishing Knowledge BaseePublishing Knowledge BaseePublishing Knowledge Base EditorialHow do I share an article with a partner or advertiser before it is live on the site? You can share an article with a partner or advertiser before publishing it on your website. Start by creating your article, complete with all body copy, taxonomy associations, imagery and so on. Learn how to create an article: How do I create an article? Leave the article as UNPUBLISHED. 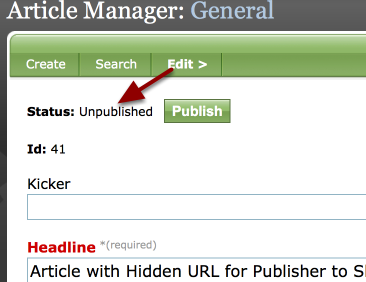 If the green Publish button appears (as shown above), the article is unpublished. 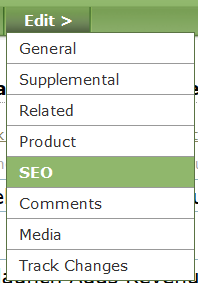 Under Edit >, go to SEO. Select the "Direct Access" checkbox. This checkbox only appears if the article is UNPUBLISHED. By selecting this checkbox, you are allowing the system to show the article to any user of your site that has the exact URL. The article will not appear in your website's search results, topic landing pages, or home page, regardless of any taxonomy associations. Copy the URL and provide it to your partner or advertiser. Provide the full URL with the HTTP:// and your domain name. Pro tip: You could also provide just the ID number after the /articles: http://www.yourdomain.com/articles/41. Zoom: Copy the URL and provide it to your partner or advertiser. After your partner/advertiser signs off, return to the article and click Publish to publish it. Update the Go Live Date/Time if necessary. Your article will now be available on your website. Prev: How can an article be the full width of the site?